On second viewing, Aquaman plays very much like it did the first time around. It’s a fun, yet flawed, superhero romp that doesn’t take itself too seriously. It’s amazing what a single movie and a billion dollars in box office revenue can do. 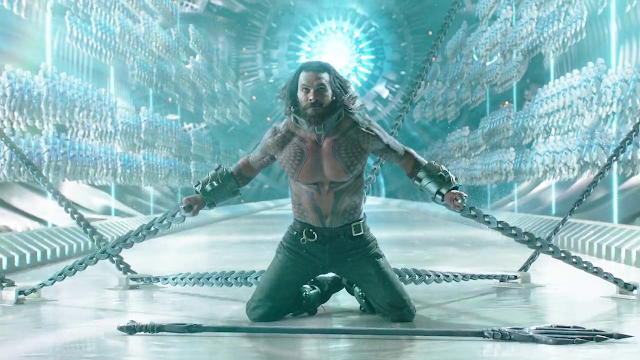 The film not only made Aquaman relatable, it made him cool as well. The movie plays more like a fantasy than a superhero movie, which is why it feels so fresh and interesting. The film’s success is primarily due to Jason Momoa’s star making performance and James Wan’s deft direction. While Momoa is basically playing a version of himself, it’s Wan who is the real star of the show. Audiences clearly responded to the film, but box office returns are naturally no indication of overall quality. Aquaman is a well-crafted piece of entertainment with a solid story, but the plot and characterization tended to suffer – with the exception of the lead character. Regardless, this is a fun movie that is hard to take too seriously. More importantly, it breathes new life into the DC Cinematic Universe. However, this reviewer still stands by the original rating attributed to Aquaman upon its theatrical release. 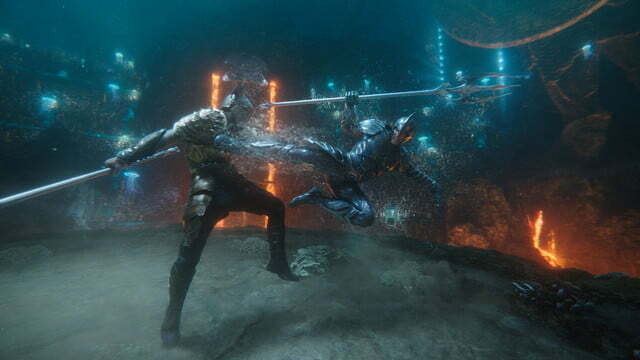 The Blu-Ray release of Aquaman features a mixed aspect ratio of traditional 2.40:1 scenes, with IMAX sequences interspersed at a 1.78:1 aspect ratio. It’s pretty rare for the latter aspect ratio to be preserved on home video releases for IMAX-shot films. So its inclusion alone adds another layer to an already visually dense film. The IMAX sequences offer a stunning level of detail, both in terms of overall clarity and information on the screen. As whole, the cinematography by veteran Don Burgess is excellently preserved on this disc. The colors are vibrant, and the film’s varied visual palette only helps this AVC encoded transfer to stand out more than it already does. While contrast is strong in the scenes with primarily live-action elements, the black levels in this transfer suffer in the somewhat murky-looking underwater scenes. Although these visual effects heavy sequences should be somewhat murky considering the setting, there are only a few select cases where true backs actually come to the forefront. Instead, we’re treated to a series of greys that further emphasize the pops of color in the film. 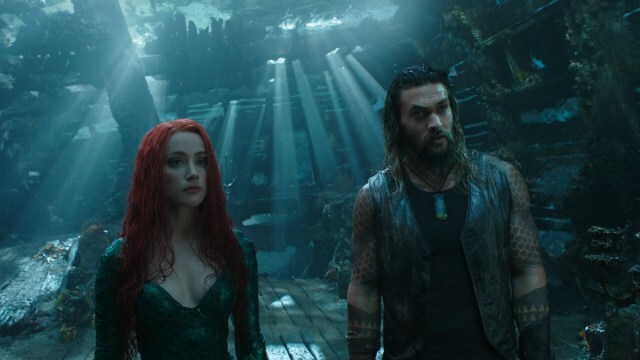 Overall, this transfer is pretty solid, especially when it comes to preserving both the textures of the practical and digital elements in Aquaman. This movie relies heavily of the sound design to sell the illusion of the film’s underwater effects. The audio mix truly knocks it out of the park. Presented on Blu-Ray with an Atoms mix as well as a 5.1 mix, the former is naturally the preferred method for viewing the film. Even though it’s not the default setting on this disc, this mix is the highlight of this release. Although the Atmos track is fairly truculent at points, it’s also supremely immersive throughout. Channel separation is excellent, especially during underwater scenes. The low end on this track also adds a ton of punch to the experience – especially within the action sequences. Dialogue is crisp and no sync issues are present, despite the constant use of the underwater vocal effects. The score by Rupert Gregson-Williams is also effective in this track, offering a nice mix that never feels too intrusive. Overall, there’s not much more that one could ask for in this Atmos track. But it’s odd for WB Home Entertainment not to make it the default on this release. The Blu-ray release of Aquaman contains a bevvy of special features for fans of the film to dig through. Unfortunately, they barely scratch the surface of the technical feats behind this film. There are roughly one hundred minutes of supplemental material, bur most of it rings slightly hollow. Perhaps the biggest glaring omission on this disc is a director’s commentary form Wan. But there’s ultimately enough here to keep fans happy. Becoming Aquaman (13:03; 1080p): This feature focuses on the casting of Jason Momoa as Aquaman. It starts half a decade ago, when Momoa was first cast. This featurette also looks at Momoa’s take on the character and his training regimen leading into shooting. Most of the featurette showcases a bunch of on-set B-roll mixed with interview footage. Going Deep Into the World of Aquaman (19:28; 1080p): Goes through the entire production of the film, from pre-production into shooting, all the way into post. It also delves into how many of the underwater scenes were shot dry for wet, in addition to the various methods used for creating believable movement in them. Although it leaves much to be desired, this is easily the most engrossing supplement on this disc. James Wan: World Builder (7:42; 1080p): Focuses on director James Wan’s vision of Atlantis, calling it a “world creation film.” Even though this featurette is essentially a puff piece, it integrates behind the scenes development footage, concept art and interview footage with Wan that ends up giving some decent insight into the world building elements of Aquaman. The Dark Depths of Black Manta (6:39; 1080p): Stars Yahya Abdul-Mateen II, as the actor dives into the history of the chatacter, along with interpretation of Aquaman’s arch-nemesis in the film itself. Abdul-Mateen II gives some insight into his take on the character. There are a few interesting tidbits here, but it’s basically a glorified interview with the actor. Heroines of Atlantis (5:31; 1080p): Explores the female presence in the film, focusing on Amber Heard’s Mera and Nicole Kidman’s Atlanna. This fairly traditional featurette mixes clips from Aquaman with interview footage, once again only skimming the surface of both actresses involvement in the film. Villainous Training (6:21; 1080p): Delves into the physical presence of both Patrick Wilson and Abdul-Mateen II in the film. It provides insight into the way the filmmakers used the fight choreography to further define their characters. A Match Made in Atlantis (3:12; 1080p): This touches on the chemistry between Heard and Momoa both in the film and on set. Atlantis Warfare (4:40; 1080p): This video establishes how Wan was able to give each of the kingdoms a specific aesthetic. 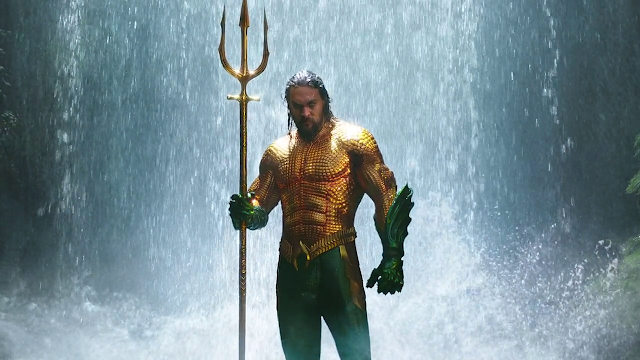 From the Atlantean suits, to the ships, gadgets, and weapons, this all too short featurette touches on all of these elements and more. Creating Undersea Creatures (7:15, 1080p): Explores the organic side of the world building in Aquaman. Additionally, this focuses on how the filmmakers were able to bring the Trench to life. Aqua-Tech (5:42; 1080p): Takes a deeper look at the filmmaking process used to create the film. Exploring the “virtual production” aspects of the production, this technology essentially allows the filmmakers to see a rudimentary version of the final shot on set. Scene Study Breakdowns (10:15; 1080p): This focuses on the trio of signature set pieces that Wan managed to create for Aquaman. The making of these sequences absolutely deserve more time. This was fun, but not sufficient. Kingdoms of the Seven Seas (6:59; 1080p): Features actor Dolph Lundgren hosting a quick exploration on the history and mythology in Aquaman. 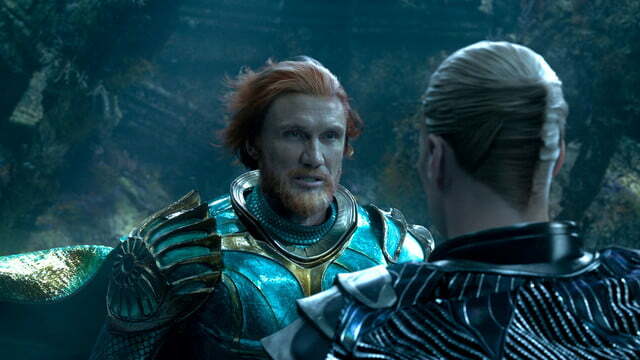 Inter-splicing footage of Lundgren on a stage with shots from the film itself, this featurette offers a nice recap of the society and aesthetic behind the various kingdoms of Atlantis in Aquaman. Shazam! Sneak Peek (3:27; 1080p): As the title implies, this sneak preview for the upcoming DC film, Shazam! showcases a scene early in the second act when Billy gets his powers. While the film itself is a pretty fun, this disc really makes Aquaman worth owning on home video. Especially for fans of the film or just the character in general, this disc is sure to please. Despite the above mentioned nitpicks, the technical aspects of this disc culminate into another top-notch release from WB Home Entertainment. Although the supplemental material is plentiful on the disc, the lack of commentary and a real in-depth look at the making of the film make them slightly disappointing – despite some solid special features here. We strongly recommended this Blu-ray for anyone who is looking to delve further into the world that Wan and company have created with Aquaman. Tags: Aquaman, Blu-Ray Review, warner bros.